The Fellowship was fortunate enough to obtain a copy of LOBSTER JOHNSON: THE PRAYER OF NEFERU from Dark Horse Comics. The story is written by Mike Mignola and John Arxudi, with art by Wilfredo Torres and colors by Dave Stewart. Lobster Johnson is investigating the murder of a man that happened during the theft of a mummy from the Metropolitan Museum. It leads him to a private party being held at The Sphinx nightclub. He encounters club owner Wilma Kazan, who wishes to obtain the power of Princess Neferu – Queen of the Underworld. This was my introduction to Lobster Johnson and it won’t be the last time I read his adventures. This is in the same vein as early Batman, Shadow, and other pulp heroes of yesteryear. Wilfredo Torres handles the natural and supernatural with ease in his artwork. One thing I’ve noticed in doing reviews is the part color is playing an important part in comics. Dave Stewart does a great job setting the mood of the story. If you want a noir book with a little action and the supernatural mixed in, check this book out. 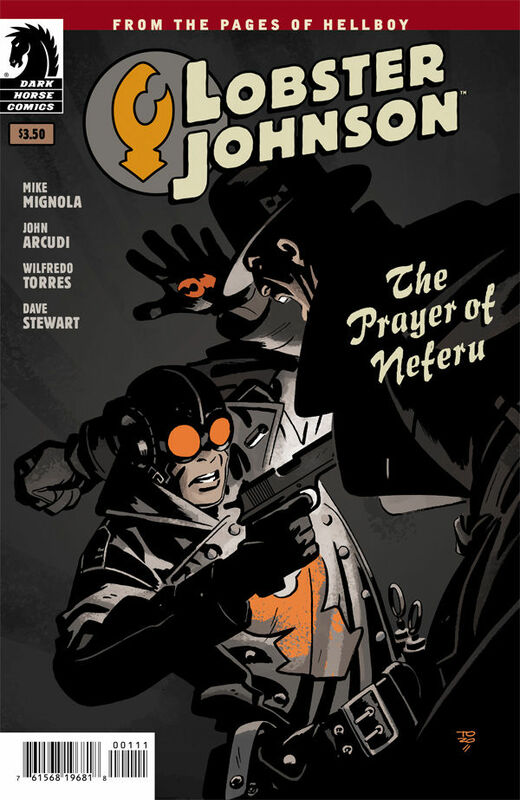 LOBSTER JOHNSON: THE PRAYER OF NEFERU is in stores now and available at www.darkhorse.com.